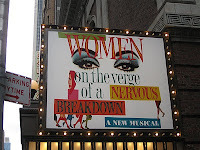 On Thursday the 16th, I went to Lincoln Center Theatre's Women on the Verge of a Nervous Breakdown with Noah. After hearing so many negative reviews from my friends, I have to say I wasn't expecting much. However, I found it very interesting and enjoyed it. I loved the team of bookwriter Jeffrey Lane and composer/lyricist David Yazbeck for their work on Dirty Rotten Scoundrels and I wanted to see if there was any of the same magic with this show. Plus, I wanted to see Patti LuPone. Simply, this is the story of an actress who has been dumped by her lover. A series of coincidences along with being stalked by his ex-wife who is not quite right lead to some comedy and angst, all while she is terribly depressed over the loss of her lover. It's based on the Spanish film of the same title by Pedro Almodóvar. I loved the stylized music and set of this show, even if there were some slow and head scratching moments. The set is very cool - swanky scenery comprised of projections and 80s furniture. There's some pretty spectacular stage magic as well. However, I can sort of understand why it's closing early, this weekend. 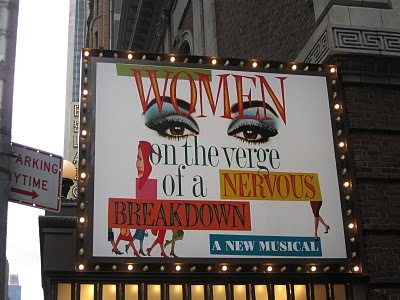 Still, I'm also surprised that more fans of each of the ladies starring in this musical weren't behind the show more because there's plenty to like about Patti LuPone and Laura Benanti. Sherie Rene Scott has some lingering moments as well. Patti LuPone was marvelous and she stole show. She was dressed in fabulous outfits by Catherine Zuber, campy but elegant. Seeing Patti in this role is a reminder of the star she is, even if her character is a supporting role. Patti has a haunting number in the second act, "Invisible" which is worth the price of the ticket. The rest of the cast was fine, with Laura Benanti standing out. Her character ditzy and cute and it's hard not to laugh at her - and she's got a number that rivals Sondheim's "Not Getting Married Today." She's just so bubbly and you want a happy ending for her. Justin Guarini did well in his Broadway debut and he's really got a lovely voice - I'd like to listen more. I admit that years ago, I went to hear him and Kelly in a Good Morning America concert. I went because I took a young pre-teen friend and even though I'm not really in to pop music, I found him enjoyable. Unfortunately, when he gets the chance to shine vocally in this show, he's curiously joined in a love song by two very weak singers, the wooden Nikka Graff Lanzarone and the corny and off-key Danny Burstein. I could have lived without Danny Burstein - he opened the show and I still cannot figure out why - this is how you want to set the tone of your show? Sherie Rene Scott was a bit wasted in this show - she's a comedienne but didn't get much of a chance here since her character is suffering from being left through out most of the show. She did have a good moments - her natural, weird comedy was probably just right for some of the lighter moments her character did have - a running gag with gazpacho was killer. My favorite moment came when she had a shared scene with lovely Mary Beth Piel, also underutilized in this show. Brian Stokes Mitchell was out, although I'm not sure he would have made a difference. There were some thrilling staging surprises and a few running gags kept things light. The music had a wonderful Latin beat, keeping with the setting in Madrid. It was hard to keep from dancing in my seat. When it was all over, Noah and I both said this is one that we'd see again. Oh good, I'm glad to see somebody liked this. I finally got TDFs to see this on what seems is now going to be the last performance, so I'm hoping to enjoy it, flaws and whatnot.